This fruit cup has aromas of fruity blackcurrant, fragrant elderflower and citrussy bergamot with a kick of apple spirit. Based on the Heston Earl Grey and Lemon Gin, the drink is blended with elderflower, blackcurrant and raspberry liqueurs, infused with eight carefully selected botanicals. QUOTE:uncork summer with this earl grey based fruit cup full of the aromas of fruit blackcurrant,fragrant elderflower,citrussy bergamot and a kick of apple spirit. Based on the award winning Heston Earl Grey and Lemon Gin, blended with elderflower, blackcurrant and raspberry liqueurs, infused with 8 carefully selected botanicals. 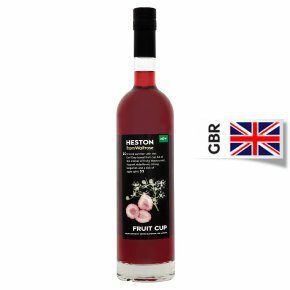 To make the perfect Heston Fruit Cup cocktail:In a tall glass, lightly crush some raspberries and peeled fresh ginger. Mix 1 part (50ml) Heston Fruit Cup and 3 parts (150ml) ginger ale. Add lots of ice and a squeeze of lime. Garnish with fresh rosemary and lime zest. 1 unit of UK alcohol. Alternatively try with lemonade: Mix 1 part (50ml) Heston Fruit Cup and 3 parts (150ml) lemonade and serve with lots of ice, sliced strawberries and fresh mint. 1 unit of UK alcohol.